He ordered that they should be brought before the interview crew to witness what they go through daily. During a seemingly friendly but stern interrogation that lasted about an hour, it was obvious that the job of Immigration officials is herculean and needs thoroughness for success to be achieved. The Immigration controller during the interview called for all hands to be on deck in fighting human trafficking. The Immigration controller during the interview called for all hands to be on deck in fighting human trafficking. I am about seven months old here and, as a matter of fact, I am new to border management and security but it is quite interesting. 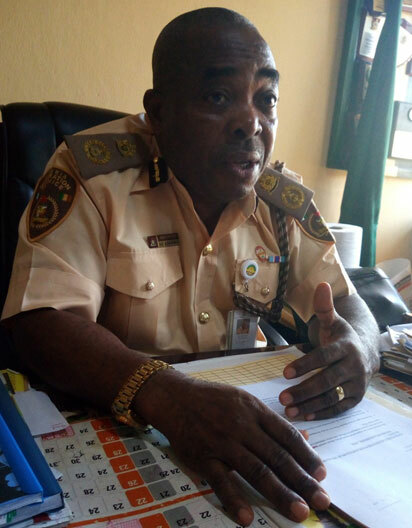 It is also challenging but, as a trained officer, I have been able to conquer most of the challenges here apart from the fact that border criminality is as old as human being because it started during the era of slave trade and Badagry was also a port through which a lot of people were smuggled to the outside world. Since I came, it has not been easy but I have done a lot. When I resumed here, I discovered that Nigeria Immigration officers were operating from Seme. That was a major challenge. Before getting to their offices, most of them would cross over to Benin Republic and the challenges from the Benin authorities persisted and I said I had to bring them back to Nigerian soil so that the embarrassment will be reduced. This was achieved within three months of my assumption of office. I brought back that office in Benin Republic down here. Our boss in Abuja, Muhammed Babandede, has a very good mission and vision on border management and security, which is one of his core interests. Border security is one of his cardinal efforts towards ensuring national security. He brought well trained and experienced officers to man the border, so our successes so far should be attributed to his vision of maintaining tight security at the borders. When I came, I discovered that people were being smuggled to Ghana, Togo, Mali, etc. I said I won’t encourage smuggling and trafficking of humans from this axis. I discussed with my officers and we agreed that it is a task that must be done. I had to come up with a strategy to curtail irregular migration from this flank. And I can tell you that since I resumed here, I have reasonably stopped people from travelling especially when their mission is undefined and in doubt, you don’t have genuine travelling documents; why you are going to where you are going? I have drastically stopped people without travelling documents from this flank from going to Ghana, Togo, Mali, Cote d’Ivoire for prostitution. We have also reunited those coming back from Ghana, Mali, Libya, victims of human smuggling with their families. What we do is to refuse them passage and send them back, but we discovered that some of them didn’t even know where they were going and, once we established that the person is from a particular state, we send him or her to the liaison office of his state in Lagos, and it is the responsibility of the liaison office to take custody of him or her and possibly reunite him or her with his family. Because of the confidence and trust that the Comptroller- General has in us, we have been doing this without any issues. I have also been working with other security agencies because you cannot do it alone. There must be synergy with other security agencies within your area of jurisdiction. For instance, when we launched the ‘Passport to Safe Migration’, we had all the security agencies in attendance to educate them on the nitty-gritty of travelling in and out of the country.